Health education is a planned, sequential, Pre-K-12 curriculum that addresses the physical, mental, emotional and social dimensions of health. The curriculum is designed to motivate and assist students to maintain and improve their health, prevent disease, and reduce health-related risk behaviors. The comprehensive health education curriculum includes a variety of topics such as: personal health, family health, community health, consumer health, environmental health, sexuality education, mental and emotional health, injury prevention and safety, nutrition, prevention and control of disease, and substance use and abuse. Physical education is a planned, sequential, Pre-K-12 curriculum that provides cognitive content and learning experiences in a variety of activity areas such as basic movement skills; physical fitness; rhythms and dance; games; team, dual, and individual sports; tumbling and gymnastics; and aquatics. Quality physical education should promote, through a variety of planned physical activities, each student’s optimum physical, mental, emotional, and social development, and should promote activities and sports that all students enjoy and can pursue throughout their lives. School Health Services are provided for students to appraise, protect, and promote health. These services are designed to ensure access or referral to primary health care services or both, foster appropriate use of primary health care services or both, and control communicable disease and other health problems, provide emergency care for illness or injury, promote and provide optimum sanitary conditions for a safe school facility and school environment, and provide educational and counseling opportunities for promoting and maintaining individual, family, and community health. Qualified professionals such as physicians, nurses, dentists, health educators, and other allied health personnel provide these services. Per administrative code, all New Jersey schools, public or private, that participate in any of the federally funded Child Nutrition programs have to adopt, at a minimum, the New Jersey Nutrition/Wellness Policy: http://www.nj.gov/agriculture/divisions/fn/news/. A state law requires all public schools (whether or not they participate in the federal programs) to follow all the nutrition standards as state in this policy. Each year prior to being approved to participate in the school nutrition program (through New Jersey Department of Agriculture) each district must certify that are implementing the policy, and they must provide certification to the New Jersey Department of Agriculture (NJDAg) that includes the person responsible, and also the person that coordinates the district’s wellness committee. Once every five years the NJDAg conducts required monitoring of the federal nutrition programs in the schools/districts and they also monitor for compliance with all the standards in the policy, and they check to see that school /districts are evaluating the policy standards. For public schools that do not participate in federal programs the NJDAg requires them to submit a signed written certification form indicating that they are following the required nutrition standards. The school district’s curriculum shall incorporate nutrition education and physical activity as consistent with the NJDOE core curriculum content standards: http://www.state.nj.us/education/aps/cccs/chpe/. These services are provided to improve students’ mental, emotional, and social health. These services include individual and group assessments, interventions, and referrals. Organizational assessment and consultation skills of counselors and psychologists contribute not only to the health of students but also to the health of the school environment. Professionals such as certified school counselors, psychologist, and social workers provide these services. The two components of a healthy school environment are the physical and aesthetic surroundings and the psychosocial climate and culture of the school. Factors that influence the physical environment include the school building and the area surrounding it, any biological or chemical agents that are detrimental to health, and physical conditions such as temperature, noise, and lighting. The psychological environment includes the physical, emotional, and social conditions that affect the well-being of students and staff. School site health promotion for staff or staff wellness includes opportunities for staff to improve their health status through activities such as health assessments, stress management, smoking cessation, exercise and physical fitness, alcohol and drug abuse prevention, nutrition and weight control, injury prevention, medical self care, mental health services, and training in first aid and CPR. Such activities help faculty and staff develop the knowledge, attitudes, and skills needed to adopt healthy behaviors and become better health care consumers. This personal commitment often transfers in to greater commitment to the health of students and creates positive role modeling. Health promotion activities have improved productivity, decreased absenteeism, and reduced health insurance costs. At the center of school, family, and community partnerships is the student. Functioning, supportive families and social support within communities contribute to students’ success. 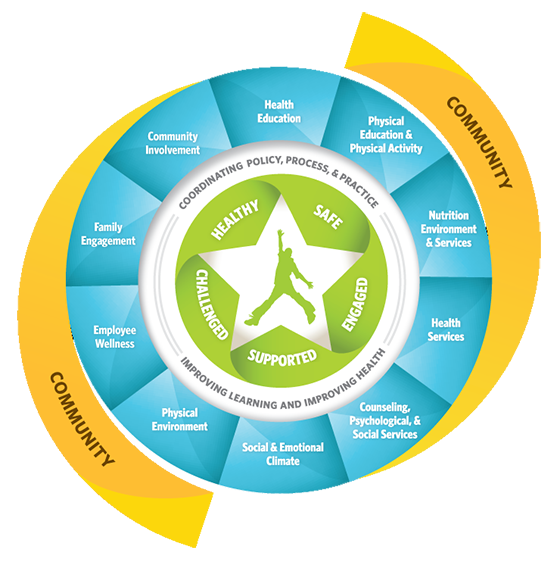 School health teams or wellness councils can build support for school health program efforts. Schools can actively solicit parent involvement and engage community resources and services to respond more effectively to the health-related needs of students.